An interesting observation maybe made in the light of the recent Navtej Singh Johar vs. UoI judgement by the Hon’ble Supreme Court of India, which read down the IPC section 377 in a certain way, is the rise in performative allyship across the nation, and across the colour of the spaces – red, saffron, corporate, capitalist, communist, and (neo) liberal. What is more interesting is the rejuvenated attempt at being the liberal ally persona – one that recognises the need to be seen as an ally, one where the performance of being an ally becomes an important act rather than the act(s) of subverting ones privileges, and unsettling their own social positions. This article becomes a space for me to rage against this hypocrisy, and shall be provocative in its own anger. I must also mention that I speak only for myself and my rage, and given that this article too, like some other writings of mine, questions the politics of representation, I shall not try to represent or speak for others, except bring out examples from my three-year long studentship at Presidency University, Kolkata and continuing studentship at the University of Hyderabad, which have been full of destitute circumstances and complex interactions. The Department of English, Presidency University, Kolkata (often abbreviated as ‘PrUDE’ by some of its really interesting students) organised a Pride March in the campus on 20th September, 2018. The walk as absolutely expected was full of rainbows and certain spaces of the campus, mainly the department of English, was also ‘decorated’ in posters with rainbows in them. The people who walked the walk, and more so, ‘led’ the ‘Pride’, were cis-heterosexual able-bodied Savarna faculty of the department along with some of their cis-het, able-bodied Savarna students. The rest of the walk too had the same demographic composition, which shall also not come shocking to us given the demographics in elite, urban universities where excellence is exclusivised. 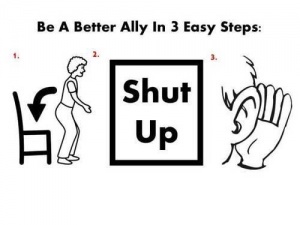 Also read: On Being A Straight Ally: Are You Actually An Encroacher? A similar suggestion had come up from the then Students’ Council in Presidency University to celebrate a Pride Walk inside the campus as a part of their annual fest, Milieu ‘18. I had written vehemently against this idea in my article in Raiot and the idea was stalled then. What is interesting to me is that many of the intellectuals who walked the Pride on 20th had not only read my article but supported it, and have more than enough intellectual capabilities and understanding to understand the critique(s) contained in it. Keeping up with the spirit of the rainbow looming over all liberal campuses, the rainbow also came with its fervour in the University of Hyderabad on 22nd September 2018, when the Students’ Union of the University organised a panel discussion titled Supreme Court Verdict on IPC Sec. 377: Mapping Celebratory Moments and Perspectives on the Struggles Ahead. The talk, apparently a very quick plan by the Union after almost 3 weeks of the judgement being delivered and a week before the next Student Union elections begin, came with so much of urgency and immediacy so as to be planned without consulting any of the (at least) openly queer students on campus. In fact, out of an audience of about 30, I could count roughly six students who identify as queer openly or otherwise. That we need to ‘celebrate’ this judgement was decided against our consent, and I had to go through the immense discomfort of an event moderated and attended by mostly cis-het students of the universities from these political platforms that have been both queer-excluding and queer-phobic on multiple grounds. In summary, an event about a judgement that concerns the lives of queer people was carried out by delegitimising the agencies of those very queer students of whom these neo-liberal groups were trying to be the ‘saviours’ of. I believe it is time to resonate to our allies very clearly that we have been here before your grand awakening and we will be here after you get bored with our narratives. Jack F. Garza in a piece titled Performative political actions are a masquerade of allyship in The Daily Californian said, “Performative allyship is not simply the culmination of inadequate, ineffective or misguided beliefs. It is an apparatus of self-aggrandising that posits the ally, not the marginalised group, as central to any movement, discussion or instance of oppression. It diminishes the structural and enduring facets of marginalisation to individual experiences of prejudice that can be “fixed” on a case-by-case basis. This ally prioritizes the accumulation of cultural capital over the prospect of change”. Two of the most commonly used words by marginalised groups who have some access to the English language are ‘oppression’ and ‘privilege’. These words are neither mutually exclusive nor can be understood or interpreted without a political context, a political identity(ies) and an intersectional framework of analysis. Allies, with all their good faith and intentions, have often been found to engage in activities which shifts the agencies of who can speak against the oppression, and turns out to be counterproductive to the conceptualised movement(s) because of decontextualisation of resistance and decoupling of oppression from the oppressed. This means that the oppressed body no longer retains the agencies to talk against the oppression, but the victim of oppression now remains a silent spectator to how the oppressors talk about oppression – this is not just unethical but also an extremely dehumanising, delegitimising move where the oppressors retain their hegemony of systemic and systematic cultural, social and political capital, and we, the oppressed, are taught how to battle oppression by our very own oppressors who now come masquerading as our saviours. This ‘Saviour Complex’ is an essence of performative allyship, and I believe it is time to resonate to our allies very clearly that we have been here before your grand awakening and we will be here after you get bored with our narratives, but there is no space for you to hijack our narratives and make it about you, at least not anymore. Performative allyship has other exclusions built in its political strategy – active exclusion of the oppressed and inclusions of the oppressors. When the majority of the organisers and IIT students decided to pay no heed to our stakes, I lay down on the road. In an absolute non-shocker of a move, the parade walked over and around me. This will begin to sound even more unexceptional when I inform you that I was one of the only two gender non-conforming persons at the venue (the other also tried very hard to convince the organisers to do a meeting instead of a walk)”. Just like Vqueeram’s queer-trans body was circumvented by the ‘Pride’, queer-trans people both in Presidency University and the University of Hyderabad have been neglected and downtrodden in the very conceptualisation of these events. Although I have mentioned this before, it becomes important to be reinstated in context of this article. Both the campus spaces that I have mentioned have been, like any other urban elite campus spaces, dominated by urban, elite, Savarna, upper-caste, upper- to middle-class, cisgender, heterosexual persons. The universities are extreme spaces of privilege and masculinities, and have been historically barring entry to queer-trans folks and pulverising the ones already within. Performative allyship has other exclusions built in its political strategy – active exclusion of the oppressed and inclusions of the oppressors. My trans body is seething with dysphoria because of the lack of gender-neutral hostels and gender-neutral washrooms, and this dysphoria not an experience of the neoliberal students’ union or students of English literature. This dysphoria as an experience is therefore, never able to make way into their agendas, their celebrations, and their ‘Prides’. While Presidency walks the Pride, I am reminded of multiple queer-trans friends from Presidency who have recounted how one of these Brahminical cis-het professors who walked the Pride with a rainbow on her face has publicly humiliated trans students for wearing clothing ‘not fit for their gender’. Many of the faculty who walked the Pride have used particular pejoratives against their queer colleagues, and one of them asked me during one of my brief interactions at the Department of English, questioning my presence in the department. I, however persisted, along with another trans friend. This Department of English, Presidency University, also has been an extremely caste-violent space, where the ratio of Dalit, Bahujan, Adivasi professors and students to their Savarna counterparts is already skewed. As if that wasn’t enough, some of these Dalit, Bahujan and Adivasi professors and students are regularly harassed in the department, their castes questioned, and their mannerisms and ‘English’ is blamed on their caste. Outside the Department of English, the posh Kolkata babu-moshai circles can be found breathing in Derrida and Spivak and breathing out Foucault and Butler, and yet they will never miss a chance to make a jibe at a woman who is outspoken and sexually-liberated. The queer persons in Presidency have no institutional structure for redressal of any of their grievances, and both the universities, like many other flout the NALSA vs. UoI Judgement of April 2014. The University of Hyderabad’s Students’ Union has been silent on queer-trans issues for many years now, it is interesting to note how three weeks after the Sec. 377 judgement, they suddenly need to pull out an event urgently because the elections are near. The University of Hyderabad has a GSCASH which is not equipped enough to even address the issues of male rapes on campus. The University has seen multiple suicides in the past few months, most of the people being either queer, trans, Dalit, Bahujan or Adivasi. There is no mental health support system for queer-trans people, and trans people on campus who are my acquaintance are a victim of systemic, systematic and institutional exclusion in UoH and Presidency everyday. In this context, I can only see farce and hypocrisy in the ally complex motivated performance. While the people who walked the Pride in Presidency want to support queer-trans rights, they do not want their cis-het anxieties challenged, the Students’ Union of UoH suffers from both the ally-saviour complex as well as an interpreted form of a liberal capitalist democracy where queer-trans people are a putative ‘Vote Bank’. This is a factory line homogenised treatment of oppressed identities – where our oppression is sidelined for the fame of the allies. This needs to condemned in the harshest words and our assertions need to be validated time and again. Some of them circumvent us trans people,and exclude us from conversations by silencing us. These spaces in both UoH and Presidency, which have excluded queer-trans people for so long and still are, and are majorly silent on queer-trans issues, have decided to ‘celebrate’ the Sec. 377 judgement without even asking the queer-trans persons (at least the out and visible ones) whether we want/need a celebration, and whether we want/need them to be a part of it. Most of these people who celebrate in their own bubbles are never seen in the Hyderabad Queer Swabhimana Yatra or the Kolkata Rainbow Pride Walk, and I personally have seen so many of them pull up their windows to begging trans women on the road. Some of them circumvent us trans people, and exclude us from conversations by silencing us, which I am scared might also be an abyss for this article. In writing this piece of rage I take great risk, but a great risk needs to be taken to dismantle oppressive structures. During the aforementioned Panel Discussion in the University of Hyderabad, the moderator while apologising to the speakers for a low audience (and not to the queer-trans community for not letting them know enough – I was informed a minute after the event began that too by a queer friend who was informed 5 minutes before), asked the audience to ‘communicate’ the takeaways from the panel to our friends. Wah re wah, now not only the burden of being delegitimised is on us, but we also have to take up the onus of letting this burden flow. Mind you, distress of queer-trans persons are never communicated across – all of it is pushed under the carpet which the campus decides to overlook and circumvent like the elephant in the room, right from the administration to the student leaders to the general student community. Like my acquaintance Gee Semmalar point out, “Power remains unchallenged. The most vulnerable continue to lead precarious lives”. Before I end this piece, the great risk still fresh in my flesh, I would like to quote Jack Garza again, “Allyship is an uncomfortable and continual process, not an identity. It is standing witness to, and being an accomplice of, the fight against oppression by those who have been left without recourse or reprieve. Replace your performative guilt with dynamic self-criticism and leave no tendril of institutional prejudice around you uninterrogated. Do not expect us to thank you for this hardship — we have been doing this for decades (centuries, even). This may be your political experiment, but this is our survival”. Sayantan is a queer trans feminist activist, poet and writer.